Here's a little girl I just finished painting for a client; so obviously, the original is already sold. Her name is Prescilla, and I hear that she's a real sweetheart. Rose City Classic Dog Show, January 20-24 - I'll be there! 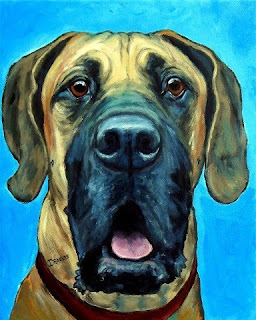 Great Dane Portrait "What, Me Worry?" Here's another acrylic painting I just finished. It's obviously a Great Dane, fawn in color, that I photographed (with permission) at the Portland Saturday Market in Portland, OR, this past autumn. He was a real sweetheart and posed very nicely for me for quite a few photos. Maybe later when I have more time, I'll do another painting of him. The painting is available for sale. It is on a 16x20" canvas, on 3/4"-deep sides, painted same as the background, staples only on the back side, wired and ready to frame or hang as is. The price is $250.00, plus shipping. 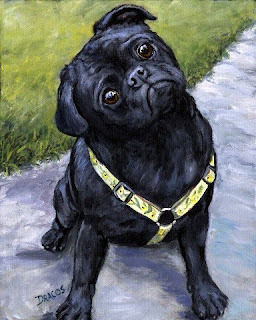 This painting, along with many others I've done, will also be shown between the days of January 20 to 24 at the Rose City Classic Dog Show, so there's a possibility it will sell at that time. So if you're interested in it, please be sure to contact me before the show. Oh, and if you're at the show, please stop by and introduce yourself; I would love to meet those who follow my work. This is a painting of our latest family addition, a little Cavalier King Charles Spaniel (black and tan) puppy, named Sammy. He's a little terror at the moment, driving all the other dogs mad with his constant flurry of activity, but he's a sweetheart, too. The original is not available, but prints and pendants are available at my website, http://www.wildwildthings.com/. I'm on a bit of a painting run these days and don't even have time to list everything I've been painting on my blog -- but they all can be seen at my website, on the home page. So if you want to see them all right away, be sure to stop by and check them out. I'll eventually try to get everything on my blog, too, just not right now because I'm awfully busy!!! 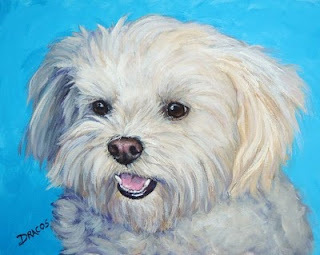 This is a sweet little maltese commission I finished recently. His name is Bentley, and he's a beauty. I'm taking a short break from doing commissioned paintings, probably until around the first of March, 2010. Commissions are a bit stressful, just because I want so much to do the best I can do for the client, so from time to time, I need a break so I can "loosen up" a bit. So be looking out for what I hope is some looser work for the next couple of months. I'm currently working on a giant schnauzer, a black pug (for which I get requests ALL the time! 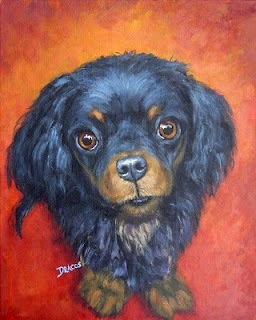 and I'm finally taking the time to paint one), and our own little black-and-tan Cavalier King Charles spaniel, named Sammy. He's an adorable puppy of five months at this time and is a real challenge for our other three older dogs, Higgins, the shih tzu; my precious Harry Barker, the pomeranian; and Casey, the rat terrier mix. So I'll be listing those very soon. And then who knows what I'll do. Maybe a few non-dog paintings???? Sounds fun! But first: I have a big dog show, the Rose City Classic, here in Portland, OR, which starts, I think, on January 18 - more exact details later - that I'll be attending to show off (and hopefully sell) my paintings, prints, and pendants. I have a LOT of work to do before the show, so at least for now I'll be doing dog paintings only. Wish me luck!